Operators: Maksimov L., Myakishev G., Izvekov V.
The visit of the member of Political Bureau of the Central Committee of CPSU, the Chairman of the Council of Ministers of the USSR Nikolay Ryzhkov to the Polish People's Republic. On the official visit NIRyzhkov in Poland. Negotiations were held with the Chairman of the Council of Ministers of Poland Messner, president Boleslavsky Warsaw, Polish President Jaruzelski. There were signature HN intergovernmental agreements. Ryzhkov visited the company in Warsaw, the city of Sosnowiec, Silesia. Visit Politburo member, Chairman of the USSR Council of Ministers Nikolai Ryzhkov in the Polish People's Republic. 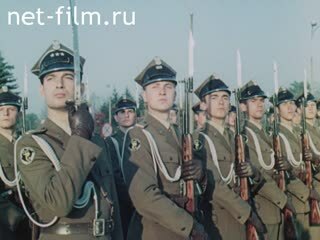 The solemn ceremony at the airport in Warsaw, Among those present Politburo member PUWP Prime Minister PNRM. H. Messner, the Soviet Ambassador to PNRM. Brovikov and Polish Ambassador to the USSR Natorf. Talks between Nikolai Ryzhkov and Z. Messner in the Council of Ministers PNRM. Laying a wreath at the Tomb of the Unknown Soldier on the area, the Warsaw. Nikolai Ryzhkov meeting with the leaders of the Warsaw party organization and the capital of the People's Council at the Town Hall; President of Warsaw Boleslavsky gives Nikolai Ryzhkov, the coat of arms Warsaw; by N. Ryzhkov (synchronously). Laying a wreath to the monument in the cemetery of Fame - the mausoleum of Soviet soldiers who fell in the battles for the liberation of Poland. Visiting Research and Production Center of electronic materials - "Tsemat." 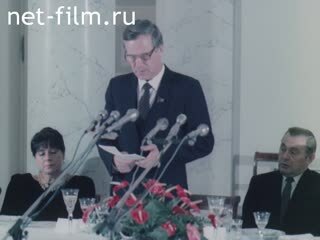 Dinner in honor of President of the Council of Ministers of the USSR Nikolai Ryzhkov; the chair of the Council of Ministers PNRM. H. Messner (synchronous); by N. Ryzhkov (synchronously). The streets of Warsaw. Mr. Sosnowiec. Ryzhkov, lays a wreath at the monument, established in honor of the revolutionary heroism of Silesian workers. Mr. Dombra-Gornicza. Ryzhkov visited Steel Guta "Katowice". Nikolai Ryzhkov meeting with the First Secretary of the Polish United Workers Party, Chairman of the State Council PNRM. Jaruzelski, Signing of the agreement on the direct production and scientific-technical relations between enterprises and organizations. Ryzhkov interviewed for Polish Television (synchronously). Off at the airport.